Geissholz, a hamlet in the Schattenhalb area, is located 2km outside Meiringen, a famous tourist resort, in a magnificent setting in the mountains of the Berner Oberland. 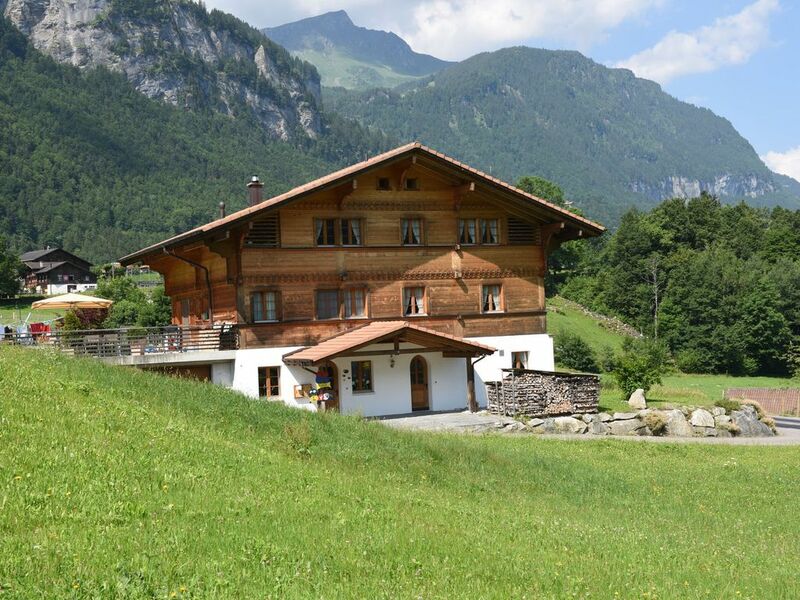 The house, a typical wooden chalet, is in a quiet location and was built and furnished only recently. The spacious apartment (42 m2) is located on the ground floor and features a terrace with seating and a gas grill, garden set, parasol and deckchairs. Explore the wonderful Haslital, from Brienzersee to the peaks of the high Berner Alps on the countless footpaths. The Aare Schlucht, a 200-m deep gulf that can be visited after walking over an impressive wooden bridge, or the Reichenbach waterfall, the location at which the renowned detective Sherlock met his doom. You can take the bus, your car, or one of the many footpaths to visit the beautiful valleys: the Reichenbach valley with its unique mountain landscape and the glacier gorge, the mountain passes with Susten and Grimsel, and the Grimselwelt. Geissholz, a hamlet in the Schattenhalb area, is located 2km outside Meiringen, a famous tourist resort, in a magnificent setting in the mountains of the Berner Oberland. The house, a typical wooden chalet, is in a quiet location and was built and furnished only recently. The spacious apartment (42 m2) is located on the ground floor and features a terrace with seating and a gas grill, garden set, parasol and deckchairs. Explore the wonderful Haslital, from Brienzersee to the peaks of the high Berner Alps on the countless footpaths. The Aare Schlucht, a 200-m deep gulf that can be visited after walking over an impressive wooden bridge, or the Reichenbach waterfall, the location at which the renowned detective Sherlock met his doom. You can take the bus, your car, or one of the many footpaths to visit the beautiful valleys: the Reichenbach valley with its unique mountain landscape and the glacier gorge, the mountain passes with Susten and Grimsel, and the Grimselwelt. Geissholz, a hamlet in the Schattenhalb area, is located 2km outside Meiringen, a famous tourist resort, in a magnificent setting in the mountains of the Berner Oberland. The house, a typical wooden chalet, is in a quiet location and was built and furnished only recently. The spacious apartment (42 m2) is located on the ground floor and features a terrace with seating and a gas grill, garden set, parasol and deckchairs. Explore the wonderful Haslital, from Brienzersee to the peaks of the high Berner Alps on the countless footpaths. The Aare Schlucht, a 200-m deep gulf that can be visited after walking over an impressive wooden bridge, or the Reichenbach waterfall, the location at which the renowned detective Sherlock met his doom. You can take the bus, your car, or one of the many footpaths to visit the beautiful valleys: the Reichenbach valley with its unique mountain landscape and the glacier gorge, the mountain passes with Susten and Grimsel, and the Grimselwelt. Schöne FeWo mit allem was man braucht, gut und ruhig gelegen. Zu Füssen des Grimsel, auch toll zum Wandern. Wat ons als eerste opviel was de geweldige stilte, wij kwamen helemaal tot rust in een brandschoon huis van alle gemakken voorzien! Een hartelijk ontvangst door onze gastvrouw waarna ze onze privacy respecteerde. Wij hebben genoten! Beautiful situation surrounded by mountains and yet quite close to Meiringen and facilities. The accommodation is bright and clean and roomy for two people. De aankomst was goed. Accomodatie is ruim en beschikt over prima meubilair, uitstekende sanitaire voorzieningen. De temperatuur in het verblijf was niet aangenaam, rond de 25 graden, vooral ook omdat ons bed ook in de woonkamer staat. Geen horren voor de ramen dus snel last van muggen en wespen. Het verblijf moet nog worden aangekleed, erg kaal, niets aan de wand. Bij aankomst evt een flesje wijn of chocolade ipv 2 haribozakjes. De omgeving is fantastisch. Van hieruit is heel veel te doen. Prachtige wandelroutes. Erg vriendelijk ontvangst. Huisje is erg netjes, ziet er nieuw uit en is schoon. Waren wat te vroeg maar dit was geen probleem. Centrale ligging met veel wandelmogelijkheden in de buurt. Rustige ligging maar wel winkels en centrum van Meiringen in de buurt. Buiten een leuk zitje met barbeque ter gebruik, mooi uitzicht.